Biography & Genealogy: James William Garnett, Class of 1875: Genealogy: Born- Apr. 6, 1852 Father- Absalom Garnett; Mother- Mary C. Early. Pat. Grandfather- Rev. James Garnett; Pat. Grandmother- unknown, Mat. Grandparents- unknown. Married- Mary M. Goodman, daughter of James Goodman in 1877. Children- 1- Mary Garnett; 2- Elizabeth Garnett; 3- Clara Garnett. 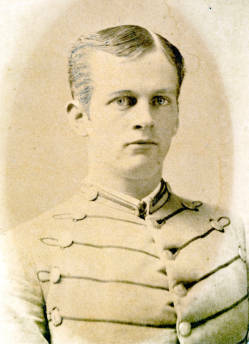 VMI Record: Entered VMI- Sept. 1, 1871; Graduated July 4, 1875 standing 38th in a class of 45. Careers: Farmer Died- May 18, 1924.